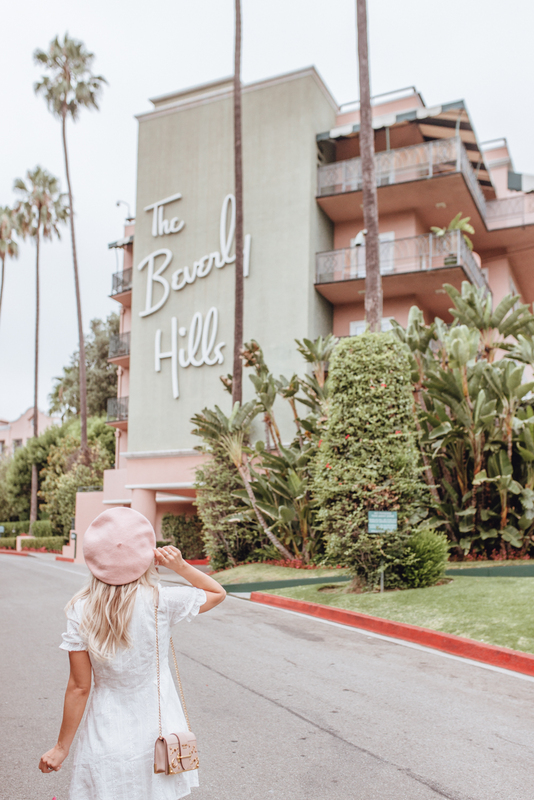 Los Angeles - Summer 2018 Travel Diary | La Petite Noob | A Toronto-Based Fashion and Lifestyle Blog. Oh Los Angeles - otherwise known as my happy place. I left a bit of my heart in California the first time that Brian and I ever visited years ago, and I try to go back as often as I can to visit it. You guys know that I've already visited LA earlier this year with Sabrina, but when Brian suggested another visit for the summer I couldn't say no. Call me boring, call me a creature of habit, I don't care - I just love Los Angeles. This trip was a bit different. Traveling with a husband versus a bestie definitely yields a very different itinerary - at least for me. While my last post about LA covered the most Instagrammable spots in the city, this post will serve mostly as a travel diary; how we got around, where we ate, and where I forced Brian to take my photo in front of. Fun times. Enjoy! Since Brian is a very confident driver and, more importantly in LA, an expert parallel parker, we opted to rent a car for our trip. Los Angeles is a city where you absolutely need access to wheels, whether it be Uber or renting a car, and I can say that renting a car in LA is so much better. It's so nice to be able to just jump into your car and take off to all of the different places on your list without having to worry about calling an Uber, or surge pricing. As for parking, most of the time we were able to find a parking spot on the street (including overnight to avoid hotel valet charges.) Honestly, I think that I would be okay to drive in LA, even with the traffic - I'm used to crazy Toronto drivers, and LA is much more chill. If you have the option, I would definitely rent a car. Even though both Brian and I are the opposite of "outdoors-y," we both really enjoyed the hike at Runyon Canyon. Right in the Hollywood Hills, Runyon Canyon is a perfect way to take in the views of the city, while getting some exercise in as well as some A+ people watching. Bring your cutest workout gear and a pair of good running shoes - you're going to need them. This hike is no joke! New to the city, electric scooters litter the streets and sidewalks and are a really fun and inexpensive way to get around. We downloaded the Bird app and could then walk up to any scooter that we found on the street, use the app to unlock it and start riding! Admittedly, this was more of a favourite for Brian - myself I do not have a need for speed, and those electric scooters are fast. It was a fun way to spend an afternoon, and I'm sure that it's only a matter of time before they come to Toronto. I know it's cliché, and we've definitely done it before, but I absolutely love renting bikes to ride along the boardwalk in Venice Beach. This time we skipped the bike rental shops that line the board walk and opted for the city bikes available on the main road. It's a huge cost savings and really easy to-do. We will definitely be using the city bike system when we visit LA from now on. Probably our most baller meal of the whole trip was our anniversary dinner at the famous Mr. Chow on Rodeo Drive. This restaurant definitely comes along with some polarizing opinions on whether it's worth it or not, but me personally I loved the whole experience. The food was pretty tasty, but the atmosphere, service and people watching was incredible. I look forward to visiting Mr. Chow again, the next time that we're in LA. I had mentioned before that Brian and I have a soft spot for fancy hotel brunches, and Los Angeles has some of our favourites. We enjoyed eggs and Moscow Mules on the patio of Chateau Marmont and it was incredible - super chill vibes. 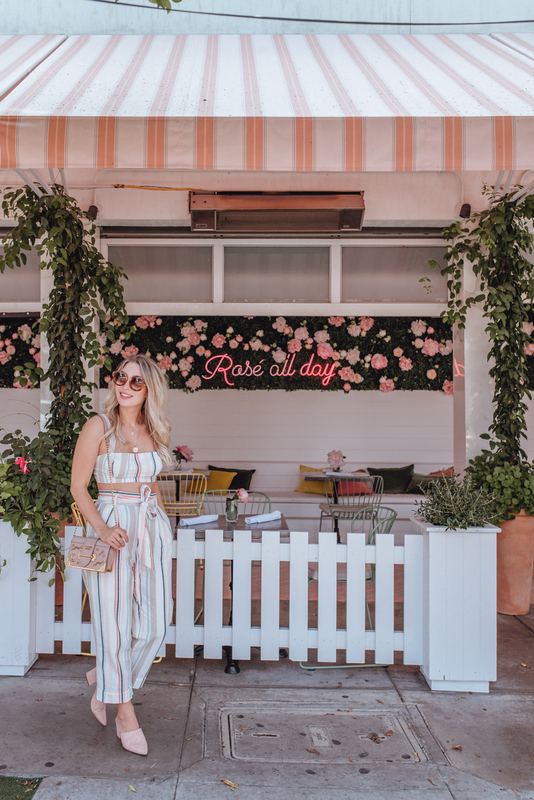 We also visited my pink paradise, The Beverly Hills Hotel's Cabana Café and had a champagne-soaked indulgent brunch. It was incredible. A nice compromise between cheap eats and baller brunches is our favourite spot on Melrose for plant-based Mexican food - Gracias Madre. We usually would grab a late lunch at this popular spot and it would fill us up until the next day. So, so good. My favourite treat to pick up when we visit Los Angeles is California Donuts. It's an unassuming donut stand in Koreatown that's curiously open 24 hours. 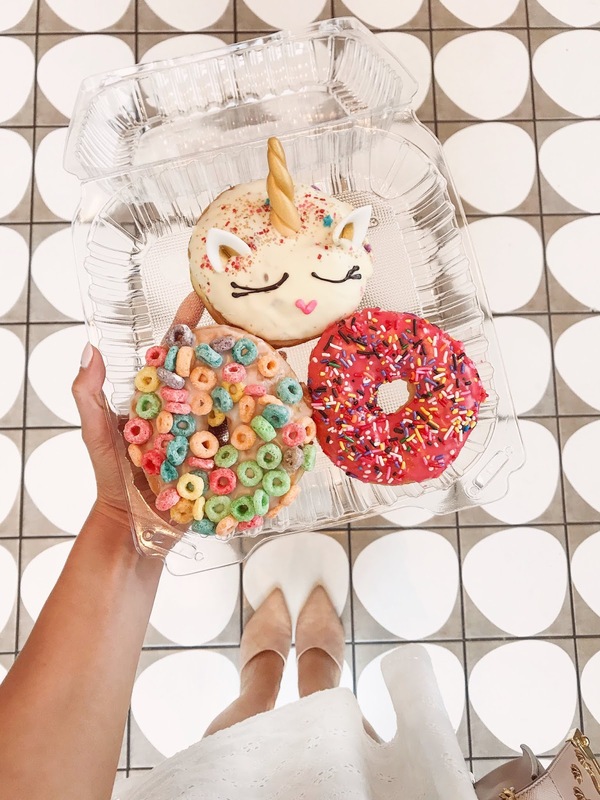 The donuts are adorable, great for photos and delicious. I already can't wait to go back! California has definitely stolen my heart, and I already can't wait to get back to LA. Stay tuned for the second half of our trip, to Palm Springs and San Diego. Have you been to LA? Where are you favourite places to visit? Let me know! OH WOW!!! I love your dress. Every time I see one of your outfits, all I can think to myself is where 'she’s getting ideas and I want to tell you how much I appreciated your thought-provoking article.